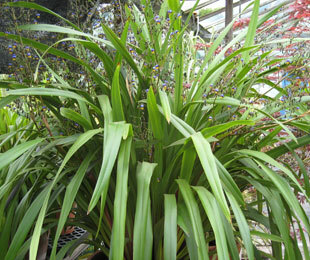 Description: This Flax Lily has broad arching leaves and blue – yellow flowers from September to November. It creates a tropical feel whilst being extremely cold hardy. 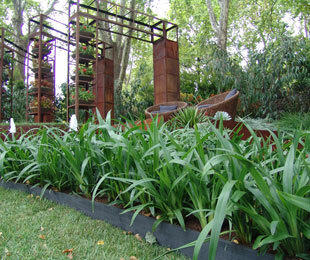 Emerald Arch® Dianella has low water requirements and is better suited to cool or temperate climates. Size: 55cm high x 50cm wide. 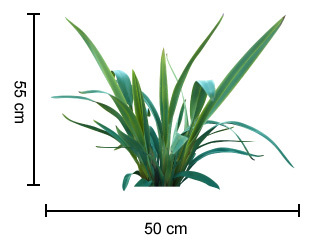 Uses: Mass plantings, specimen plantings and low water gardens. Position: Full sun to heavy shade. Tolerates drought and frost. Emerald Arch® Dianella suits well drained soils to clay soils. Avoid very poor soils. For Sydney and north, light shade to heavy shade only (can use in full sun if near the coast). Care: Water as required for 8-13 weeks until established. Plant in a well mulched garden (chunky mulch is recommended). Ensure crown or base of plant is not below soil. Use slow release fertiliser in spring. Trim older leaves as required and cut back halfway every 3-7 years (will look better with pruning every 3 years, this depends on your requirements). Where it works: NSW, ACT, VIC, TAS, SA & WA. For more detailed information on Emerald Arch® Dianella click here.